Based on reviews from 1,133 users. Learn how our rankings work or see our guide to Adidas Yeezy sneakers. Updated Apr 2019. When it first became known that Kanye West was joining Adidas, it seemed that the sneaker world stood still. The rapper and self-proclaimed GOAT (Greatest of All Time) had formerly partnered with Nike to produce his Yeezy shoes, but the two fell out over royalties and creative control of the shoe designs. After the company failed to meet his demands, he left for good and joined the shoe giant’s biggest rival, German sportswear brand Adidas, in 2013. Since then, Adidas and Kanye have continuously disrupted the footwear industry with drops of new colorways and models of the Adidas Yeezy sneakers. They have been so popular that they promptly sell out within minutes. Below is some information about this world-renowned collection, including its most notable models. In all, there have been several Adidas Yeezy sneakers released over the years, which are also often reissued in new colorways during different months of the same year or after some time. These color options, in turn, are very much in demand and are sometimes the basis for how sought-after the model is. Below is the list of Adidas Yeezy sneakers and their corresponding colorway releases over the years. On February 8, 2015, the brand revealed the official name of the first model in the Adidas Yeezy sneakers collection: the Yeezy Boost 750. Posters bearing the image of the shoe were plastered on all Adidas flagship stores. Light Brown. The “Light Brown” color of the Yeezy Boost 750 was released on February 14, exclusive to those who reserved a pair via the brand's mobile application. The release was limited to 9,000 pairs in New York City only, which sold out in just 10 minutes. For the rest of that month, the model was made available at retailers and shops. Glow in the Dark. The Yeezy Season 2 collection was released on February 2016, featuring the Yeezy Boost 750 “Glow in the Dark.” It had an all-grey color theme along with a fluorescent gum outsole. The sneaker was made up of higher grade leather and suede. The next and last Yeezy Boost 750 model was dubbed the “Chocolate,” with a leather and suede upper in a brown color scheme. It had the same phosphorescent sole as its predecessor. The Yeezy Boost 350 is the second of the Adidas Yeezy sneakers, introduced on a worldwide scale. Turtle Dove. This colorway is the first version of the Yeezy Boost 350, released on June 27, 2015. An infant counterpart of this colorway and the Pirate Black were launched on August 26, 2016. Pirate Black. This is the all-black version of the model that was made available on August 22, 2015. A revised variant of this colorway was released in 2016, featuring added heel padding and support. Both versions look outwardly similar, however. This olivine edition of the shoe was retailed exclusively at stores that sold the Yeezy Season 1 clothes collection. Oxford Tan. A light brown color theme was incorporated in this latest option of the Yeezy Boost 350. This was a redesign of the Yeezy Boost 350. A different pattern and a huge stripe that runs around the shoe containing the label “SPLY-350” were among the new features, unique among Adidas Yeezy sneakers. The heel tab was also removed. A transparent design was also used on the sole, allowing full visibility of the Boost technology in the midsole through an opening in the grid pattern of the sole. This colorway was revealed during the Yeezy Season 3 spectacle. It was released on September 24, 2016. An all-grey Primeknit and sole were used, while the “SPLY-350" label was done in an orange material. Copper, Green, and Red. These three new colorways were released on November 23, 2016. The “Copper” had an all-black outsole and a large stripe with the “SPLY-350” characters. Made up of Core Black and Core White accents, this colorway was released on December 17, 2016. It also used a black-colored Primeknit material and outsole, while the stripe was done in white. Initially released on February 25, 2017, the Zebra colorway was restocked on online and physical retailers as well as in some Adidas stores on June 24, 2017. It prominently featured black stripes over a white-colored overlay. The unique and never-before-seen combination led to this colorway being much valued and hyped in the sneaker world. Cream White. This much-awaited version was finally released on April 29, 2017. A classic black-and-red colorway, this edition was introduced on February 11, 2017. It was described as having a “triple-black” design, along with a red-tinted “SPLY-350” label. Semi-Frozen Yellow. Featuring a bright yellow-colored Primeknit upper and gum sole, this limited edition of the Yeezy Boost 350 V2 was released on November 18, 2017. Beluga 2.0. This colorway was aptly named as it has a similar pattern and color to the first version of the Yeezy Boost 350 V2. It was made available at various stores with plenty of stock for many people. Blue Tint. Released on December 16, 2017, this last colorway of the popular model features a consistent look on its Primeknit pattern, doing away with the stripe on the sides. The Yeezy 350 Football Boost is the only sports shoe in the Adidas Yeezy sneakers collection. It was designed specifically for football and has made an appearance in the kickoff game of the NFL. Unfortunately, it did not comply with the NFL regulations for uniforms as it did not have a solid color on the base. As a result, Texans player DeAndre Hopkins was fined for wearing it. It has a similar feel and appearance as the Yeezy Boost 350, but the upper was made up of Primeknit. SprintSkin was also used to reinforce the upper, which sits atop a premium cleat frame. Turtle Dove. This is the first and only colorway to be released for the Yeezy 350 Cleat so far. The design for this model has leaked ahead of its release and caused a lot of criticism due to its bulky appearance. However, fans and shoe collectors alike had changed their minds when the shoe was officially launched. It has since been just as in-demand as other Adidas Yeezy sneakers. Desert Rat. The first colorway of the Yeezy 500 was launched on December 2017 on a pre-order basis. Delivery was slated for March 2018. Super Moon Yellow. This colorway came in a combo package that included a pair of sweat shorts and a hoodie. Kanye West wore this version in Los Angeles during the NBA All-Star Weekend activities. Two websites sold the shoes on an online raffle basis. It was re-released on April 14, 2018, sold by online raffle reservation and through retailers. The Yeezy Boost 700, also named the Wave Runner, is the official running shoe in Kanye West’s Adidas Yeezy sneakers line. Its appearance has also caused a lot of attention and controversy as it looked different from the past aesthetic of Adidas Yeezy sneakers. It debuted in 2017 on the Yeezy Season 5 Fashion Show. White/Gum and Black. These two colorways were released in 2018. They were exclusively sold at the Yeezy Supply online store. This model was part of the Adidas Yeezy Sneakers Season 1 series and was released on October 29, 2015. Only select retail stores and online marketplaces sold the sneaker. It was inspired by the design of the military duck boot. Peyote, Moonrock, Pirate Black, and Chocolate. All of these colorways were released simultaneously. With a retro look inspired by a 1980s trainer, the updated Yeezy Powerphase casual sneaker is a different offering from the Adidas Yeezy sneakers series. This original colorway featured a premium white leather upper with a striped Adidas branding in green and the Trefoil logo in red. It had the word “Calabasas” in gold lettering on the upper. A tonal grey version was released internationally on December 9, 2017. Core Black. This colorway was made available on March 17, 2018. Many people have found that the Adidas Yeezy sneakers have varying sizes and fit. As such, it’s best to know more information before deciding on buying a pair, especially as these shoes typically cost a lot of money. Here are the different models from the series, with more information about their fit and sizing. As the first of the Adidas Yeezy sneakers, the Yeezy Boost 750 was initially released in whole sizes, but later releases started to include half sizes. The sizing has been described as a half size or one size bigger by users. A size such as an 8 in this shoe is said to fit like a normal 8.5 or 9. As such, going one size down than one’s usual should be appropriate. It’s available in men’s sizes from 6-13 in medium width. Some wearers have complained that it’s difficult to get the heel inside the shoe, but once it is settled the rest of the fit feels fine. Those with wide feet or big ankles may want to go one size up. Kanye West’s second shoe in the Adidas Yeezy sneakers line had the same problem as his first. It was found to fit one size bigger than designated. Fans hoped that it would not be the case as the Yeezy Boost 350 is running-inspired, which are typically smaller than boot-like shoes such as the Yeezy Boost 750. Sizes were released for both men and women, ranging from 4-16 in medium width. As the updated version of the Yeezy Boost 350, the V2 runs true to size this time, unlike other Adidas Yeezy sneakers. However, it's said to be tighter than the first edition, so those with wide feet should opt for a half size larger so that there will be some room for spreading the toes. This model was found to offer a more comfortable ride than the Boost 350, with more Boost along with a wider footbed. Men’s sizes are available from 4-14 while women’s sizes range from 5-9.5. Different from other Adidas Yeezy sneakers, the Yeezy 350 Football Boost uses the brand’s 5-star cleat frame and SprintSkin reinforcement on the upper. These two technologies are commonly used in the brand’s other cleat models. Its sizing and fit are like that of standard Adidas cleats, which feature a snug fit that's optimal for playing across a field. The Yeezy 500 features a sturdy exterior that’s in line with the trend of the so-called oversized “Dad Shoes,” which some Adidas Yeezy sneakers adhere to. Because of the seemingly robust structure, people have thought of sizing down or buying true to their size. Men’s sizes from 5-14 were made available. Although the model has a wide toe box, it is still narrower than that of the Yeezy Boost 350 V2. It has also been observed to run small. At best, buyers have advised that going a half size up would be suitable. This way, there will be more wiggle room. For those who found the Yeezy Boost 350 V2 true to size and with room to spare, then it will be safe to get the usual size for the Yeezy 500. In contrast with previous Adidas Yeezy sneakers, the Yeezy Boost 700 has been found to fit true to size, with some more room to spare for those with wide feet. Its tongue has moderate padding to bring added comfort for wearing. Men’s sizes from 5-14 are available. This duck boot-inspired model from the Adidas Yeezy sneakers collection was released in women’s sizes from 5-12 and men’s sizes from 4-14. It fits true to size. The fit has been described as similar to that of a traditional boot, with a platform-like design for the heel beneath. With the look of a classic trainer, the Yeezy Powerphase from the Adidas Yeezy sneakers line provides a sturdy fit for the foot with its leather upper. Men’s sizes ranging from 4-14 were released for this model. The sizing is said to run small and narrow, so it’s best to go up by half a size, especially for those with wide feet. A lot has changed since Kanye and Adidas unleashed the first model of the Adidas Yeezy sneakers collection back in 2015. They were released at already expensive prices, but these were marked up even more at reseller markets. Adidas Yeezy sneakers have become some of the most sought-after shoes in the world, produced in limited quantities to drive up the demand. Below is some more information about the shoes and their price range, including specific colorways that are valued higher than others. This model was released in 2015 at the price of $350. Due to its limited availability, a pair of the Yeezy Boost 750 “Light Brown” has an average resale value of more than $2,000. This is only to be expected as it was the first colorway introduced in the whole Adidas Yeezy sneakers collection. The Core Black was sold at the same retail price and now has an average reseller price of $1,000 and up, and the Glow in the Dark version is also sold at the same average price. Chocolate, the last colorway released for this model, costs $750 in average reseller prices. Turtle Dove, the first color released for the Yeezy Boost 350, was sold for $200 in 2015. It now has an average aftermarket price of upwards of $2,000, a premium for Adidas Yeezy sneakers. Meanwhile, the Pirate Black, also retailed at $200, now averages more than $1,000 in reseller prices. The Moonrock, the Oxford Tan, and Pirate Black’s 2016 reissue are sold at a price range of $1,000-$1,300. With an original price of $220 in 2016, the Beluga colorway of the Yeezy Boost 350 V2 now sells at the average price of $800 and up from resellers of Adidas Yeezy sneakers. The Green option, sold for the same cost later in the same year, has a current average price of $750. Meanwhile, because of its classic black-and-red appeal, the Bred colorway has a much higher reseller price north of $1,000. Other colorways such as Copper and the Oreo sell for $700 and up on average. The 2017 Bred edition sells for $800. On the other hand, the Zebra, the Cream White, and the Semi-Frozen Yellow have reseller prices that range from $500 up to $700. Lastly, the Beluga 2.0 and the Blue Tint are relatively more affordable at average prices between $300-$400. A colorway released on June 2018, dubbed the Butter, has an average resale price of $200 and up. When they were released in 2016, these Yeezy cleats were sold initially for $250. It has not proven to be as popular as the causal models in the series. As such, they are sold at reseller markets of Adidas Yeezy sneakers for a marked down average price of $219. Initially sold for $200, the 2017 Super Moon Yellow and the 2018 Blush colorways now have an average price of $250 and up, as can be found at listings of Adidas Yeezy sneakers. Initially sold for $300 when it was launched in 2016, the Solid Grey version of the Yeezy Boost 700, a.k.a. the Yeezy Wave Runner 700, is now valued at upwards of $500 among Adidas Yeezy sneakers. The Moonrock version of the Yeezy 950 was set at a price of $585 when it was introduced as a boot in the 2015 Adidas Yeezy sneakers series. Its resale price is now $600 and up. Another colorway is the Chocolate, released in the same year at the same price, now with a current average price of $740 and so. For the off-white Peyote edition, the average price is around $700 when resold, while the Pirate Black is at $600 and up. Sold in 2017 for $120, the lowest retail price for a pair of Adidas Yeezy sneakers to date, the Yeezy Powerphase has since appeared in the resale market at slightly higher prices. The white Calabasas shoe is now set at $250 and up, while the Grey colorway averages around $159, and the Black version is little changed at $125. 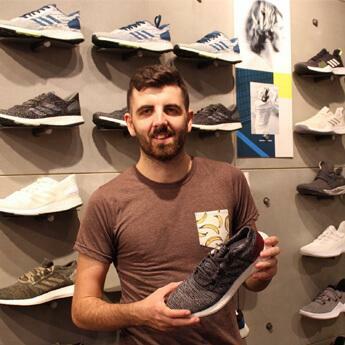 Over the years, with the burgeoning demand for Adidas Yeezy sneakers, it has become notoriously difficult for many people to get a pair of their own. This is especially true with latest releases, where the stock is typically limited, and pairs are reserved ahead of time to avoid long lines and crowds in the stores. Drops of new Adidas Yeezy sneakers have therefore become a significant event in itself and knowing where to go to be able to buy a pair is essential. The following is the list of places where one may be able to buy Adidas Yeezy sneakers. From Adidas: online and in-store. In the not-so-distant past, people could line up overnight at Adidas stores and get a pair of shoes once they open. It was as simple as being an early bird and being close to the front of the line, but this was not the case for the Adidas Yeezy sneakers. Instead, the brand uses an online reservation system through the Confirmed app to distribute its new Adidas Yeezy sneakers to the lucky few. One needs to sign up for each upcoming release to reserve, and those who were able to get a pair will be able to pick up their goods in-store. Adidas also lets people buy online through their website. Usually, Adidas Yeezy sneakers become available at a random time during the announced launch date. Once the shoes are online, customers will have 10 minutes to complete the transaction. It's a long waiting game, and the stock sells out in a matter of minutes. Local sneaker retailers. Due to the high demand for Adidas Yeezy sneakers, there is a need to raffle off pairs of the latest releases to avoid the trouble that comes with crowds. Local sneaker stores, in particular, are known for doing this. As always, getting updates through their social media channels is the best way to know release and raffle sign-up dates. Footwear chain stores. National shoe store chains such as Footlocker also utilize the online raffle system when they come into some stock of Adidas Yeezy sneakers. They usually provide a list of their local store branches where the shoes will be available, including the date and the steps on how to reserve a pair. Online sneaker websites. Online stores sometimes use a raffle system to choose the ones who are lucky enough to have a pair of Adidas Yeezy sneakers. At other times, their limited stocks are up for grabs on a first-come, first served basis. Reseller market. Perhaps the easiest yet most expensive way to get a pair of Adidas Yeezy sneakers is through resellers. They were the ones who were able to snag a new release, and they resell their pair for hundreds of dollars more. It’s considered a lucrative market which Kanye and Adidas have tried to beat several times. Since people are willing to pay even up to thousands of dollars for their own pair, the aftermarket scene continues to thrive. Sites such as eBay and Grailed are where these resellers list their highly expensive Adidas Yeezy sneakers. For all their popularity, Yeezy shoes from Adidas don’t offer much in the way of technology. Although Adidas is known for its various advances in the footwear industry, its Yeezy line is still more style-centric than innovative in the function department. Here are the few technologies that have been used on Adidas Yeezy sneakers so far. Together with BASF, the leading chemical company in the world, Adidas came up with Boost technology. The system uses TPU, a solid granular material, which has been enlarged and molded into small energy capsules. These are used in the midsole and provide a distinctive Styrofoam look and feel. Compared to EVA material, Boost is three times more temperature-resistant and therefore delivers a more consistent run. When Kanye West decided to use this advanced cushioning technology on his widely popular Yeezy Boost 750 and Yeezy Boost 350, it signaled Boost’s entry into the world of fashion. The system makes Adidas Yeezy sneakers not only stylish but comfortable as well. Most shoes are made by stitching together various pieces of different materials, such as leather and mesh. PrimeKnit, on the other hand, is produced by digitally and seamlessly knitting the upper of the sneaker in one piece. The result is footwear that is ultra-lightweight and more durable. In the Adidas Yeezy sneakers line, the brand uses PrimeKnit on several models. The Yeezy 350 Football Boost or Yeezy 350 Cleats, the collection’s sole sports offering, uses PrimeKnit. Similarly, the Yeezy Boost 350 V2 makes use of the knit technology in some of its colorways. This technology is used on the brand’s popular soccer cleats. It’s a single layer of synthetic material with a textured pattern in 3D. It's geared towards enhanced performance during wet conditions. The pattern enables water to slide off the shoe instead of being absorbed by the upper. It’s used in the Yeezy 350 Football Boost, the only sports shoe in the Adidas Yeezy sneakers line. Kanye West has wanted to go into fashion ever since his music career took off. He believed that he could influence not just the music industry but the clothing and footwear industry as well. But despite the global influence of Adidas Yeezy sneakers, West didn’t start with the brand. Here’s a brief background about the rapper’s shoe partnerships. Kanye West started making his mark in the sneaker game by creating a quirky and vintage-inspired shoe with Japanese brand A Bathing Ape or BAPE in 2006. It was called the “Dropout Bear” Bapesta. A few years later, he went into the world of luxury fashion by partnering with Louis Vuitton. Three different silhouettes named after three important individuals in West's life were the result of the collaboration: Don, Mr. Hudson, and Jasper. After this stint in the high-end world, West finally arrived in the sports and casual footwear scene, teaming up with Nike. He and the brand worked on the Air Yeezy line, which featured flamboyant silhouettes. The series also featured West’s signature mid-foot strap, along with a spiky heel. Even with all the buzz and attention that the Nike Air Yeezys received, the brand and the artist were destined to part ways due to a few differences in opinion. This was how West came to Adidas, who offered him full creative control and bigger pay. The fact that Adidas gave West a lot of control shows how much the brand trusted his style and direction. This trust had since paid off in a lot of ways, as the Yeezy shoes from Adidas have become globally famous, transforming the casual shoe game. Because West has an international fan base and his family has a substantial social media influence and public image, his shoes always generate a lot of news and speculation even before they release. This has become a phenomenon in itself, where fans and sneakerheads try to grab a pair of Adidas Yeezy sneakers despite the limited numbers. Shoe lovers are not the only ones to have proudly worn their Adidas Yeezy sneakers, as celebrities are also just as enamored of West’s footwear line. The Kardashian-Jenner clan, of course, are loyal to West’s shoe line, especially his wife Kim Kardashian and sister-in-law Kylie Jenner. From the music industry, Jennifer Lopez, Big Sean, Joe Jonas, Rihanna, Lorde, Taylor Swift, The Weeknd, Travis Scott, Tyga, Pharrell Williams, and Jay-Z have been seen wearing Adidas Yeezy sneakers. Even off-duty supermodels such as sisters Bella and Gigi Hadid agree that Adidas Yeezy sneakers are great for casual wear, sporting them while walking around the streets. Top athletes such as basketball superstar LeBron James and tennis champion Roger Federer are also fans of Adidas Yeezy sneakers. Actors Kevin Hart, Jonah Hill, and Sophie Turner, among many others, have also joined the Adidas Yeezy sneakers trend, wearing their shoes during relaxed activities and even at red carpet events. In the hip-hop world, rappers often add “-eezy” to their names or nicknames, a trend which has become popular among many artists. Thus, Kanye West took his nickname “Ye” and made it “Yeezy,” which became the name of his clothing and Adidas Yeezy sneakers line because it was memorable and easy to trademark. What do the numbered Yeezy names mean? Adidas Yeezy sneakers that belong to the "350" model are the low-tops, while the "750" shoes are the high-tops. Basically, a higher number means a higher collar, which is why the boot-like Yeezys are called the "950" sneakers. Meanwhile, the V2s of the 350 has the "SPLY-350" label on them to differentiate from the first model. What does the “SPLY” label on Yeezys mean? The “SPLY” label on Adidas Yeezy sneakers can either mean “supply” or “Saint Pablo Loves You.” For the latter, it’s a reference to West’s song “Saint Pablo,” from his album The Life of Pablo. It tells about West’s various personal issues and hardships, including his financial debt and private thoughts. What makes the Yeezys so popular? Adidas Yeezy sneakers are very popular for a few reasons. First, it's the peak of Kanye West's self-built brand and image, and his legions of fans in both the worlds of music and style have loyally followed him. The stock is also limited, the styles are unique and urban-inspired, and the kicks have also been found to be comfortable. Why are Yeezy shoes so expensive? Kanye West wanted his Yeezy label to have an air of a luxury brand, but at the same time, he wanted his Adidas Yeezy sneakers to be still accessible to many consumers. This is why he retails his kicks for $120-$585. However, these models are so in-demand in the aftermarket scene that they can be priced hundreds or even thousands of dollars more. Even if they do not have the same quality as other luxury names as Balenciaga and Common Projects, Adidas Yeezy sneakers still have Boost technology in them and are fairly stylish and comfortable. This day and age is also a time when Kanye is considered highly influential, especially in the fashion world. In short, his Yeezy shoes are considered an extension of the man himself, which is why they can sell for ultra-expensive prices. How limited are Yeezy shoes? The first model in the Adidas Yeezy sneakers series, the Yeezy Boost 750 “Light Brown,” only numbered 9,000 pairs. At one point in 2016, Kanye West himself once said that there are only 40,000 pairs produced for each release. How does one spot a fake Yeezy from a real one? Due to the profitability of the Yeezy shoes from Adidas, more and more fake models are popping up. Often, buyers can't tell if the pair they just bought from a reseller is legit or not. One of the few things to look at is the stitching. Real Yeezy shoes have a cross-over stitch with square gaps in between. Another reliable way of checking a shoe’s authenticity is to look at the Boost outsole, a trademark of Adidas Yeezy sneakers. A set of dimples or tiny dots appear a few times in the material. Models that don’t have these are not real. The insoles should also mirror each other when it comes to the branding, and not have a pattern going in the same direction. For the logos, the Trefoil and YZY labels should not be printed too bold or big and should look more subtle and smaller. What are the Adidas Yeezy sneakers made up of? Depending on the model, Adidas Yeezy Sneakers are usually made up of a knitted upper with a unique pattern. PrimeKnit is used on a few of the shoes, which utilizes seamless woven yarn that makes it more flexible and sturdier. The sock liners are made to be antimicrobial, while the midsole is, of course, made up of the popular Boost technology. Some models in the Adidas Yeezy sneakers line also use leather and EVA material, such as the Yeezy Powerphase. Suede and mesh were also used for the Yeezy Wave Runner 700. A suede material also makes up the arch support of a few of the Adidas Yeezy sneakers. How does it feel to wear Yeezys? According to sneaker lovers and Kanye fans, wearing Adidas Yeezy sneakers makes one feel like the coolest person in the area. Although the shoes' Boost make-up offers a comfortable feel, each model still offers different levels of comfort due to differences in design. It's mainly the style that makes the wearer feel confident and the fact that Yeezys have such an exclusive and trendy appeal. Do past Yeezy models quickly get outdated as new releases come in or do they remain fashionable? Because Adidas Yeezy sneakers are so hard to get, they remain fashionable no matter what year they were released, even as new models and colorways are introduced. However, there are still some color options that are more desirable than others, such as the original 750, the Light Brown, and the original 350, Turtle Dove.